One of the biggest challenges for a small distributor is handling a large purchase order. Sure, most people agree that large orders are good. The problem is that large orders come with large expenses. Most small distributors don’t get credit from their suppliers and need to pay upfront. However, their clients often ask for 30-day terms. So you have to pay your supplier quickly and then wait a month – or two – to get paid. Many startups and small businesses simply can’t afford this wait. They usually try to solve the problem by using financing. This approach makes sense. They can use the financing to pay the supplier and settle once the client pays. Unfortunately, most regular financing options won’t work for them. In principle, conventional financing should be able to help with this problem. A loan would work – though a line of credit would be better. The problem is that getting a business loan is difficult. Most banks won’t provide financing unless your company can show substantial collateral. By the way, most banks will not count your purchase order as collateral. They want to see real estate, equipment, and accounts receivable. Unfortunately, this requirement is why most small distributors and re-sellers can’t get conventional financing. One option is to use a loan that is backed by the SBA. For large orders, you can try a 7a loan. For smaller orders – under $50,000 – you can try a Microloan. However, the SBA only offers guarantees. The loans still need to be underwritten by a bank using its lending standards and time frames. This underwriting process can make SBA-backed loans a tough choice for companies that need quick funding. 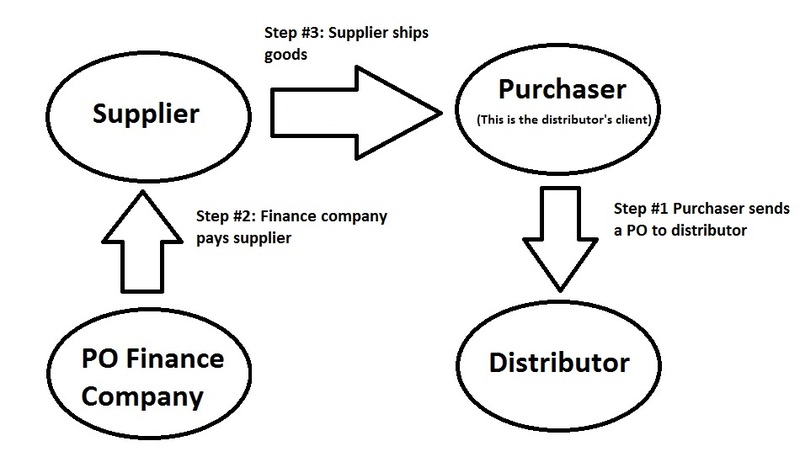 One alternative is to use purchase order (PO) financing, which uses the actual order as collateral. Well, the order is not collateral, per se. But delivering the order often generates an invoice. This future invoice is good collateral and can be financed in certain circumstances. Purchase order financing offers a simple proposition. A finance company pays your supplier expenses. This payment allows you to deliver the goods and fulfill the order. The transaction concludes as soon as your customer pays for the goods in full. 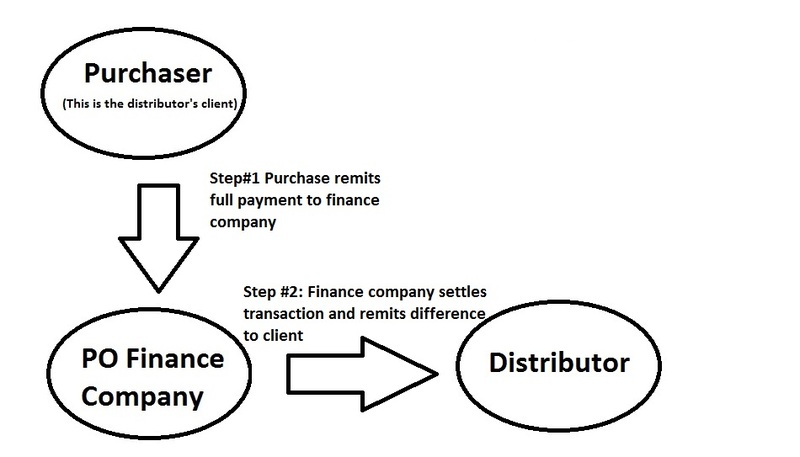 The following diagram shows a simple transaction. One important difference between PO financing and other solutions is in how the payment is settled. The customer remits the full payment to the finance company. This transaction allows the finance company to recover its investment and get its fees. The rest is remitted to the client. The following diagram shows how the settlement flows. Does PO financing work for every transaction? PO financing will help you if you resell finished goods, i.e., if you buy goods from another company and resell them at a markup. You can’t modify the goods, though you can repackage them. Unfortunately, this type of solution won’t help you if you manufacture goods directly and need money to pay multiple suppliers. I particularly like a few aspects of PO financing. First, it is flexible and has no maximum limit. Instead, the limit is determined by the transaction. The limit is based on the size of the order, the credit quality of your client, and your ability to execute the order. Second, it’s available to small firms that don’t have much collateral – or operating history. However, your client must have strong commercial credit. This feature can make PO financing a great option for small startups that aren’t well funded but have good potential. The primary drawback of this solution is its cost. It’s not cheap. Costs can average 3% per 30 days. As a result, PO financing can work only with transactions that have high gross margins. Ideally, gross margins should be a minimum of 30%. This margin ensures that the transaction has sufficient cushion to absorb unexpected challenges. You can learn more about this solution from this resource library or by watching this video: Purchase Order Financing – How Does it Work?